Native to parts of southern Brazil, Uruguay, Paraguay and Argentina. Rivers, tributaries and standing waters including pools and small lakes. Corydoras species prefer sandy substrate as they enjoy rooting about in it looking for morsels of food. Can be prone to infection of the barbels if kept in poorly maintained gravel. Corydoras will appreciate some cover in the form of rocks or bogwood. Gut analyses of wild specimens have shown it to be an opportunistic omnivore, consuming a range of worms, crustaceans, plant matter and other zoobenthos. It’s similarly adaptable in the aquarium, accepting virtually anything offered. Feed a varied diet consisting of a good quality dried sinking food supplemented with regular meals of small live and frozen foods. Females grow considerably bigger and are much more rounded, particulalry when inbreeding condition. The breeding group should be transferred to a breeding tank (18″x12″x12″) would suffice. Bring the fish into condition by feeding plenty of live or frozen foods such as bloodworm. When the fish are in condition and the females suitably ripened, perform a large water change with water approcimately 5°C cooler than the tank water. This may have to be repeated over several days before spawning is triggered. When the fish enter spawning mode, they will become much more active. A good indication of this is that the fish will swim up and down the front of the glass relentlessly. The males will begin to pursue the females until spawning begins. 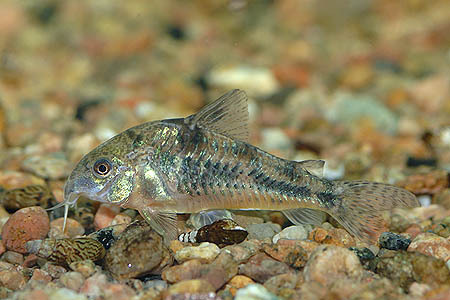 Corydoras adopt a T-shaped spawning position, by interlocking their pelvic fins. The female will release a clutch of eggs at a time and hold them between her pelvic fins, where they are then fertilised. The female then swims off and deposits the eggs, often on the aquarium glass or plant leaves. The process is repeated until all the eggs have been laid. As several pairs may spawn simultaneously, there can be several hundred eggs. Cories are not as likely as some fish to eat their eggs but it is still best to remove the adults when spawning is complete. Eggs hatch in around 3 days. Fry should be fed small foods such as microworm initially and from there progressed onto powdered food, brineshrimp nauplii and on to standard aquarium foods. Maintaining water quality is key to raising cory fry so ensure regular water changes take place. Be careful not to syphon out any fry! 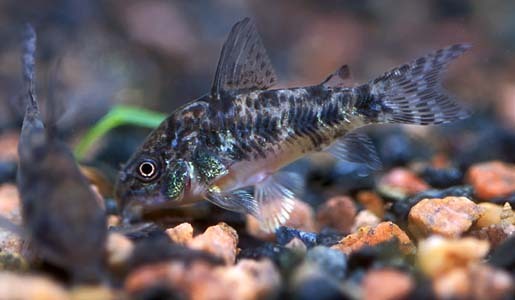 Corydoras are members of the armoured catfish family. The genus name means “helmet skin” and the fish live up to this name as they are rather tough little fish. They also have spines in the leading rays of the pectoral fins to deter larger predators from eating them. Corydoras are sometimes observed taking a gulp of air at the water surface: this is because they can absorb oxygen through their gut. It is not known why cories do this even on oxygen rich waters. Along with the bronze cory, the pepper cory is one of the most commonly found cories in the hobby. 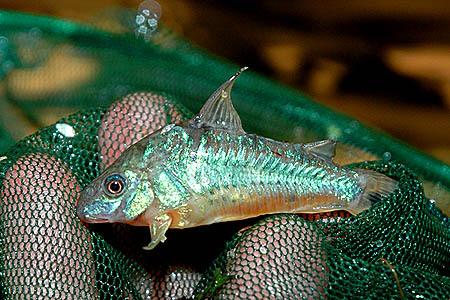 Most of the available fish are captive bred, specifically for the trade but wild-caught specimens are occasionally available and are much more vividly coloured. Perfect introduction to Corys…only downside is they are one of the bigger species. I have found them to be social, active, non-aggressive, bulletproof – and dumb as a bag of nails! Other than a couple of losses due to various water issues I have had good success with C.paleatus. I have even kept them alongside pygmy corys without problems despite the obvious size difference. Breeding couldn’t be easier – add cool water and stir! OK so not quite but as an introduction to egg laying fish they are a good start. In a community the eggs were invariably eaten,notably by gourami, but I saved a batch and soon had 4 babies swimming around. I kept these for a couple of years until I eventually rehomed them as adults. Their larger size is a bonus for those who want corys but don’t want/have sand or fine gravel. They are capable of moving sizable chunks of substrate in search of food. Whilst I wouldn’t recommend very large grains (pebbles!) as food is likely to sink down out of reach and decay moderate sized and smooth 5-10mm is easily moved by the adult fish. Leaf litter also works and I’ve had corys disappear under whole leaves as well as resting on top. Whilst they will take as much flake food as they can find I definitely recommend adding pellets or granules, plus the occasional live food -bloodworm and microworms are much appreciated as they will rest on the substrate. Too often corys, and the cheaper species in particular, are seen as cleaning crew only and are fed meagre diets. 1. They don’t respect territories and although they may learn to avoid such as when my gourami nested, it does take time and can stress the other fish. 2. When surfacing they seem to be a more splash and dash than any other species I’ve kept. I’ve seen them hover halfway then still bump much bigger fish on the way up as though they haven’t looked – I suspect my last Honey gourami may have been ‘bumped’ out the tank as I heard a splash and a thud as it hit the floor whilst I had the lid off – and neither are known as skittish jumpers! Perhaps small surface dwellers like halfbeaks or known jumpers like hatchets, may not be a perfect match with this species?